It's wedding season and many couples are preparing for the big first dance. 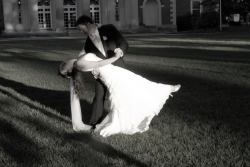 In the last couple of years, the trend for couples is to have a choreographed first dance. This trend only seems to be growing, especially with the popularity of shows like So You Think You Can Dance and Dancing With The Stars.